UM, who was it that caused this humanitarian crisis on the US-Mexican border by not enforcing US immigration policy? House Minority leader Nancy Pelosi (D-CA) held a press conference after her tour of the humanitarian crisis of thousands unaccompanied minors flooding across the U.S.-Mexico border and called it a “humanitarian opportunity”. HUH? Of course that was after she commented that “We are all Americans”. Which sadly is the real reason why San Fran Nan cares at all about this situation on the border … turning a crisis into an opportunity and making thousands of “unaccompanied children” US citizens and government dependent Democrat voters. We have to ask ourselves, why did this happen under the Obama administration at this time? What else would folks think from South American countries when you do not enforce United States immigration policy? Pelosi explained, “We are all Americans — north and south in this hemisphere,” and urged America to see this as not a crisis but an opportunity “to be helpful.” She also said she wished she could simply “take home” the thousands of children temporarily housed in the overburden facilities. According to the U.S. Customs and Border Protection agency, in the past fiscal year more than 47,000 unaccompanied children have crossed the border into the United States through Mexico with the majority coming from Guatemala, Honduras, and El Salvador. Put your money where your mouth is Nancy. Powerline points out that we could put many of these young people that you claim to care so much out in and on the many homes and property you own. Take them home with you, if you really mean it. Pelosi said repeatedly that she wants to take all the kids she has seen in Texas home. Actually, she could: not all, but quite a few of them. The Obama administration certainly wouldn’t stop her from breaking the law. And Pelosi’s various mansions could house quite a few Central Americans. 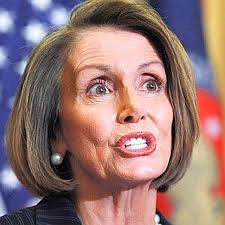 Her husband Paul, the brains of the family, is a very rich man, which frees Nancy to fool around with politics. This is the Pelosi mansion in San Francisco. Nancy could house 20 or 30 Central Americans there. But that’s nothing. The Pelosi vineyard in Napa Valley could be home to several hundred. Look at the low population density!